Debra Broz received her Bachelor of Arts from Western Kentucky University and her Juris Doctor from the University of Kentucky. She always loved south-central Kentucky and came back to practice in Bowling Green after law school. Debra's practice always centered on everyday people. She worked for a personal injury law firm immediately following law school, where she made partner very quickly. 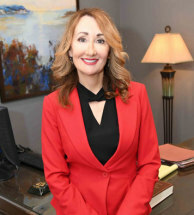 In 2000, Debra left that practice to start her own law firm, where she continues to practice in the areas of personal injury, Social Security disability and bankruptcy. These are the areas Debra loves and has worked in for 20 years. She sees her work as a privilege since she helps those in their time of need. Debra's goal in the personal injury area is to help injured people receive the medical care and financial compensation they deserve. She uses her years of experience to successfully help injured people. Debra is a former board member and board secretary of the American Red Cross. Debra is a member of the Bowling Green Noon Lions Club and the Chamber of Commerce. In 2010, Debra was nominated for the Bowling Green Human Rights Commission Women of Achievement Award. She was awarded the Pro Bono Publico Award in 2003 and 2010. The Bowling Green chapter of the American Red Cross awarded Debra an Outstanding Service Award in 2002 and again in 2003. The children of south-central Kentucky are important to Debra, and her community efforts demonstrate her dedication. She is a current board member of the Barren River Area Child Advocacy Center, where she served as board president. She has worked with Junior Achievement and is active with Newspapers in Education.